Artificial intelligence, blockchain and smart cities are some of the technologies defining du’s ICT journey. In an interview with Telecom Review, Jihad Tayara, vice president ICT Business Development, du, and Marwan Bindalmook, SVP ICT Solutions & Smart City Operations, du, talked in depth about the operator’s journey to improve customer experience and to position Dubai as a leading smart city. EITC reported strong growth in the first nine-month period. What are the elements that enabled this growth? When we first launched our business back in 2007, we were dedicated to offering “choice” to our customers. We also sought to be seen as the preferred telecom operator in the UAE. However, today that mission has evolved and we now seek to integrate into people’s lifestyles and to become the preferred lifestyle operator of choice. Transformation has remained at the forefront of our business objectives. We have come a long way in a short period, but our success is defined by continually striving to challenge our capabilities in the telco sector. On the enterprise front, we’ve found success in moving beyond connectivity. Today we are offering an entire value stack of solutions – from basic connectivity, to security, datacenters and cloud, all the way to breakthrough technologies. We aim to be an ICT solutions provider and the partner of choice for our customers. As we continue to drive this new ecosystem in a connected world, the measure of success will be primarily defined by new technologies, innovative new solutions, platforms and partnerships that will enable a transformation agenda. Artificial intelligence has become an important pillar in enterprises’ strategies, notably in the UAE. How is du using AI to improve customer experience? AI is part of du’s key strategic pillars for driving change and is part of our ongoing commitment to the UAE AI Strategy 2031. With new technologies on the horizon that will disrupt the future, our customer-centric business objectives seek to make the customer experience as seamless and even more natural than ever before. Du signed MoUs in April 2017 with Ultimate AI from Finland, and Polish Quantum Lab, to enable enhanced customer experiences and interactions. 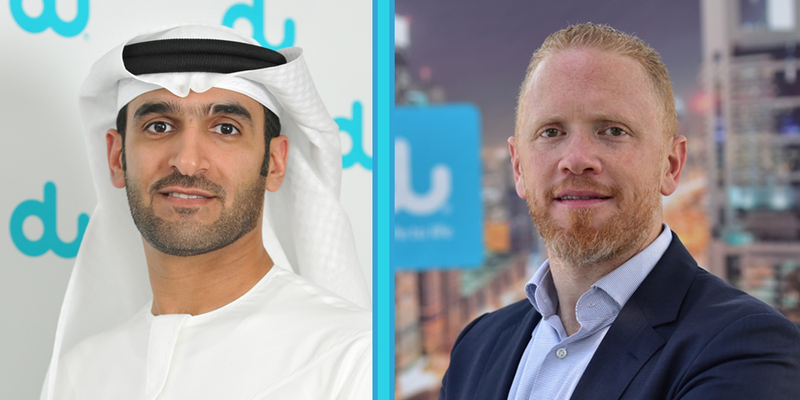 In partnership with Dubai Future Accelerators, du is integrating its partners' AI messaging capabilities into its network. Through the implementation of this AI-specific engagement, customers will be able to communicate with du’s customer care and services, and devices in their smart homes and offices via text and/or voice messaging on the channels of their choice – all in real time. Most recently, we formalized an ongoing collaboration with Microsoft for an artificial intelligence program designed to empower employees, engage customers, optimize operations and streamline the delivery of products and services. Microsoft’s technologies, such as Cognitive Services and Facial Text Speech, are being evaluated to strengthen our overall customer experience through intelligent customer care. Providing a seamless customer experience will continue to drive the market, and the value of our services and offerings will definitely be offset by the experience factor. Additionally, AI technologies are being showcased at the EITC Idea Hub to demonstrate technological developments that focus on the digital services of the future. Dubai is ranked among the world’s top smart cities. What role does du play in keeping Dubai among the world’s leading smart cities? Du is a proud strategic partner with the Smart Dubai Office and is playing a crucial role in powering the Smart City 2021 vision. The Smart Dubai platform unites city services, IoT, cloud services, big data and digital identity to build a comprehensive point of exchange for government and private sector services. As the Strategic Partner for the Smart Dubai Platform, du brings a thorough know-how of Dubai’s landmark approach to smart cities, exemplified by the company’s ongoing smart city initiatives, continuing investment in smart infrastructure and long-standing support of entrepreneurship and fostering innovation. Examples of du’s role in making the smart city vision a reality can be seen through the next generation Dubai Pulse operating system and dashboard. Through Dubai Pulse, du is working to help offer city services, big data, digital identity, cloud and IoT capabilities. Being the strategic partner for the Smart Dubai Office, we will be playing an important role of deploying this central operating system for the city. The end goal is to make Dubai the happiest city on earth through technological innovation and implementation, and to set the benchmark for cross-sector partnerships for smart cities across the globe. How is EITC contributing to the achievement of the UAE blockchain strategy that was launched in April 2018? According to your expert opinion, how can blockchain help businesses? EITC has taken large strides towards recognizing the UAE blockchain strategy that was launched in April 2018 by His Highness Sheikh Mohammed Bin Rashid Al Maktoum, vice-president and prime minister of the UAE and ruler of Dubai. In light of this, du is partnering with ConsenSys to build the first blockchain platform as a service (BPaaS) in the UAE. BPaaS is a cloud native blockchain infrastructure that can provision private blockchain networks with a high level of customization, support multiple consensus algorithms with monitoring, managing capabilities and smart contract capabilities on the ethereum blockchain, and will support multiple blockchain frameworks in the near future. Additionally, our smart concierge is a smart identity platform that utilizes blockchain technology to ensure a secure and comprehensive digital presence and engagement solution. Du has also partnered with NMC Healthcare in the UAE to implement electronic health records with the use of blockchain technology. This is an initiative from du, as a member of The Global Blockchain Council, which was established by the Dubai Future Foundation, to test and accelerate the implementation of blockchain technology in the country. The transformation agenda for blockchain realization is no longer in the distant future; it’s happening all around us. Reliable data is needed in our ever-growing digitalized world, and blockchain innovations hold the key for next generation technologies to enhance our country’s role as a global innovator. Discussions around blockchain are now becoming a reality, and the opportunities these solutions can provide for businesses are immense as they offer companies massive scalability, compatibility and better software with low-cost access to required technology. In your opinion, which stage has du reached in its ICT journey? Du is passionately committed to its ICT agenda, working on several new emerging technologies to enable the futuristic smart city in the UAE. We have come a long way in the ICT space, positioning ourselves as a ‘Smart ICT PARTNER’ rather than just a traditional telecommunication provider. Today, what differentiates us from the current ICT players in the market is our delivery as a systems integrator for major projects in this space, whereas others are still working on pilots. We have been able to deploy more than 400 data sets for Dubai Pulse, the Smart City Platform by the Smart Dubai office - the digital backbone of Dubai. We are the system integrator for Silicon Park in Dubai Silicon Park where more the 25 smart services have been deployed - this is the first Smart District in the UAE. While offering our wide range of IoT solutions, we also focus on the well-being of the community and are proudly working on a fire safety solution where we have installed more than 1000 sensors. We are also deploying the National CRM program for the Telecommunications Regulatory Authority. Our ICT solutions portfolio comprises of a good mix of solutions including: IoT solutions, cloud & security solutions, infrastructure as a service, platform as a service, blockchain platform & AI platform as a service, data science & analytics and smart cities and smart district solutions. As du, we are embracing new disruptive technologies and will continue our ICT journey by bringing new innovative solutions, platforms and partnerships to life.